A key molecule in slowing down skin ageing, the skincare industry has presented product after product with hyaluronic acid as the star ingredient. Despite its popularity, not many may be certain about the science behind this molecule. Here, we breakdown the benefits of hyaluronic acid so that you have the sufficient knowledge before your next purchase. Also known as hyaluronan, hyaluronic acid is a naturally occurring polysaccharide that is extensively distributed throughout our connective tissues, and is a key element of the dermal extracellular matrix. The extracellular matrix has many functions: facilitates intercellular communication, provides support and segregates tissues from one another. We can find most of our hyaluronic acid in soft connective tissues and our skin. In fact, about 50% of the acid in our bodies is found in our skin. Functions of hyaluronic acid include hydration, lubrication of joints and supporting the derma extracellular matrix. During tissue injury and scar healing, more hyaluronic acid is produced to activate the appropriate immune response for recovery. In the skin, we will find the hyaluronic acid content to be much higher in the dermis compared to the epidermis. The acid in the dermis helps to regulate water balance, ion flow and works as a sieve to filter out unwater molecules. As a skincare ingredient, a crucial function is the high water-binding ability of the hydrophilic (water-loving) acid. If we already have hyaluronic acid in our bodies, why are skincare products infusing this ingredient into their formulas? As we grow older, the amount of hyaluronic acid in the skin decreases. To replenish our skin’s source of hyaluronic acid, topical application of this acid has emerged as a new step in our skincare routine. Hallmarks of youthful skin include resilience and pliability. These characteristics are largely due to the skin’s high content of water. And as you may guess, skin ageing is associated with the loss of moisture in the skin, with the key molecule involved being hyaluronic acid. This makes the ingredient a star favorite in cosmetic dermatology and skincare products. For years, we may be more familiar with hyaluronic acid as an injectable. An accredited dermatologist injects hyaluronic acid into your skin, allowing facial lines and wrinkles to be filled temporarily to recover soft-tissue volume of the skin. Many industrial fillers exist, with the main differences being the source of hyaluronic acid, concentration, the use of anesthetic and type of crosslinking. The conventional use of hyaluronic acid as fillers instead of topical application is due to the size of the molecule. While the hyaluronic acid molecule is 3,000nm in diameter, intercellular space is only 15 to 50nm. This would mean despite the valuable functions of this ingredient, it is unable to penetrate into the skin’s dermis layers. 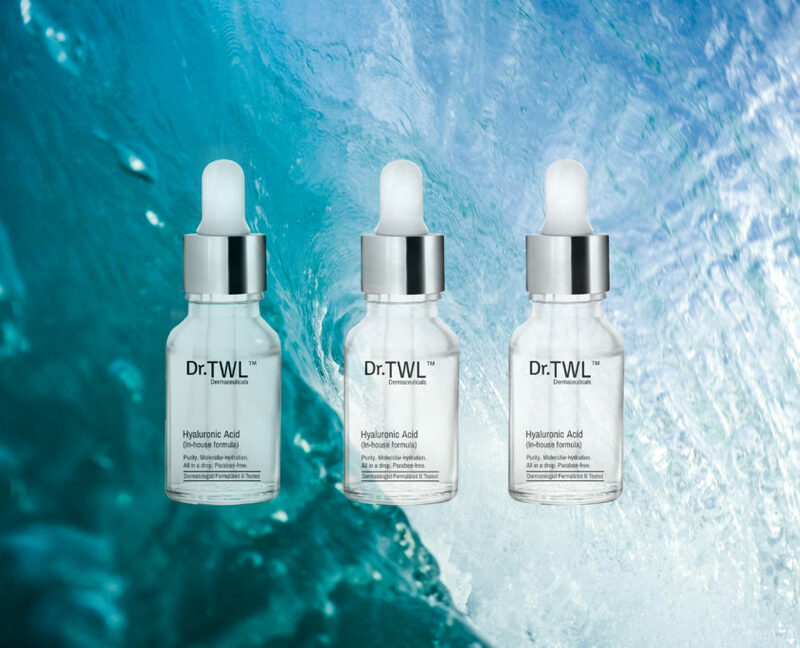 With the advancement of science, the size of hyaluronic acid molecules has been successfully reduced without disrupting its essential structure. This allows it to cross our skin barrier to be delivered to our dermis layers for improved hydration. How to choose hyaluronic acid products? The hyaluronic acid found in most skincare formulations are synthetic, thus what really separates an effective serum from the others is in the concentration and the manufacturing process. A laboratory-grade serum is likely to be more effective and reliable, and make sure to check that it is paraben free. Parabens are preservatives found commonly in beauty, household or industrial products to prevent the growth of bacteria and microbes. Common types of parabens include methylparaben, ethylparaben and propylparaben. These preservatives have found to be mimic the activity of a hormone called estrogen. Increased estrogenic activity is associated with certain forms of breast cancer. 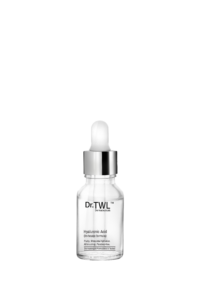 For a dermatologist-formulated and approved serum, look out for cult favourite Hyaluronic Acid (In-House Formula). An intensely concentrated, laboratory-grade pure serum freshly compounded for total skin hydration, this paraben-free serum will be able to penetrate deep into the skin’s layers to moisturize and offer visible plumping.